Identify the integrated nature of green and sustainable building design as called for in leed version 4. Assess the ability of permeable paving products to contribute to sustainable site design. Explain the significance of the building envelope and mechanical systems working together to achieve energy efficiency optimization while still providing daylight and views. Explore ways to select sustainable products and materials that are beneficial to building performance as well as human health and indoor environmental quality. The green building movement has become fully entrenched in design and construction, not just in this country but around the world. According to the U.S. Green Building Council, more than 79,000 projects are participating in the Leadership in Energy and Environmental Design (LEED) program across 160 countries and territories, comprising more than 15 billion square feet. USGBC estimates that nearly 5 million people experience a LEED building every day. Further, the ongoing rate of green building growth is reported at a staggering 1.85 million square feet per day being added to the list. What might have been seen as a fad or trend a few decades ago is now firmly part of the definition of a well-designed building. Owners and clients have come to expect that architects know and understand the principles of green and sustainable design, and they expect their buildings to perform accordingly—whether they pursue certification or not. In light of this evolution, the LEED program has evolved with it. The original LEED rating system was replaced by LEED 2.0, while both have been sunset and replaced by LEED 2009, which itself will sunset for new registrations on October 31, 2016. This means that starting on November 1, 2016, the only option for registering new or renovated buildings, existing buildings, neighborhoods, or homes under the LEED program will be under LEED version 4 (LEED v4). This may sound like little more than an administrative detail, but in fact, this latest version of the hugely popular green building rating system has raised the bar on performance. Those who have used it already have noted that buildings designed to reach Gold or Platinum certification under previous versions might find that they would only qualify at a lower level under LEED v4 unless they made some green design and construction upgrades. The changes reflect not only an increase in performance but the ability to be more applicable in countries around the world. In light of the above, design teams are searching for proven strategies to enhance their green and sustainable projects. It is no coincidence that the construction industry has responded with evolving materials, products, and systems becoming available to meet that need. 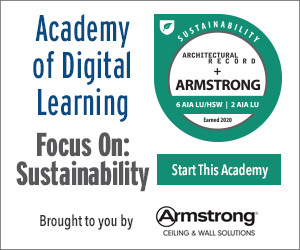 In this course, we will look at six different examples of updated choices that architects can design and specify into projects in the quest for higher-performing green and sustainable buildings of all types. 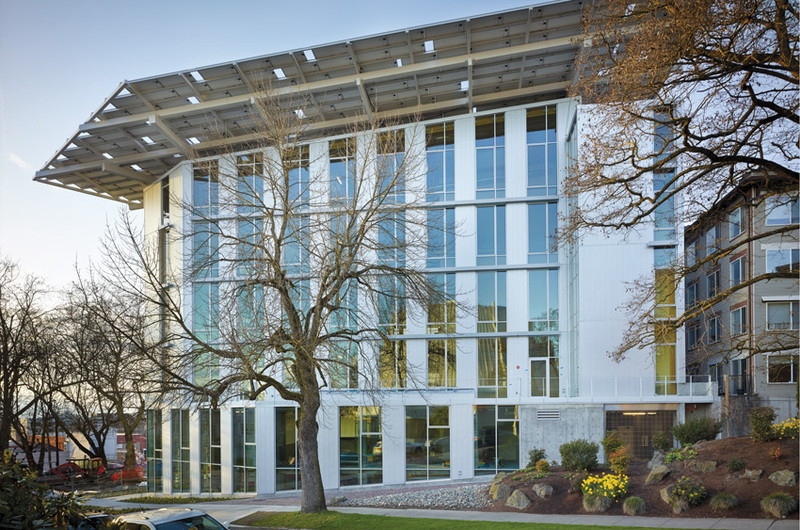 The Bullitt Center in Seattle is regarded as the “greenest commercial building in the world” and incorporates numerous sustainable design features into a holistic design. In the Sustainable Sites (SS) category of LEED, there are a number of prerequisites and credit options for minimizing the impact of construction and helping natural conditions flourish. One of the credits here that has always carried a lot of point potential is the management of rainwater, in particular reducing or eliminating rainwater runoff. By this way of thinking, rainwater is seen as a natural, on-site resource that is part of the site’s hydrology rather than a waste product to be collected and piped away. The design issue that usually comes into play in this case is the size, makeup, and location of paved areas, whether asphalt or concrete, for vehicle or pedestrian access, parking, and movement. Such pavement is commonly impervious to rainwater, meaning that it needs to be designed to slope, drain, and collect the rainwater somewhere else. Collection is commonly done by spending a fair amount of money on underground structures, such as storm drainage basins, piping, and culverts to move the water elsewhere. Movement could mean piping it to an on-site retention pond, an underground storage tank, or connecting to a public storm drainage system. Overall, the whole system needs to be sized to accommodate a worst case flood event since rapid rainfall will produce rapid flowing runoff and other problems if it can’t be accommodated fully. Permeable pavers have become available in a wide range of finishes, styles, and appearances, making them suitable for a wide range of site designs. Of course, there is an alternative. None, or at least less, of this expensive underground equipment would be needed if the rainwater were allowed to percolate naturally into the earth the way that it probably had done for centuries before the paving showed up. This natural infiltration has less environmental impact not only on the immediate site, but on the ultimate site where water is channeled since lower volumes and rates of flow of water are less likely to create runoff, erosion, and flooding problems. The green building method to achieve this, when paving is needed, is to use a system that allows water to permeate through into the soil. In some locations, that might include porous concrete or porous asphalt, but conditions need to be right for those products, and a local supplier needs to be available. A more predictable and aesthetic solution is to use open-cell permeable pavers that can handle pedestrian or vehicular traffic or both. 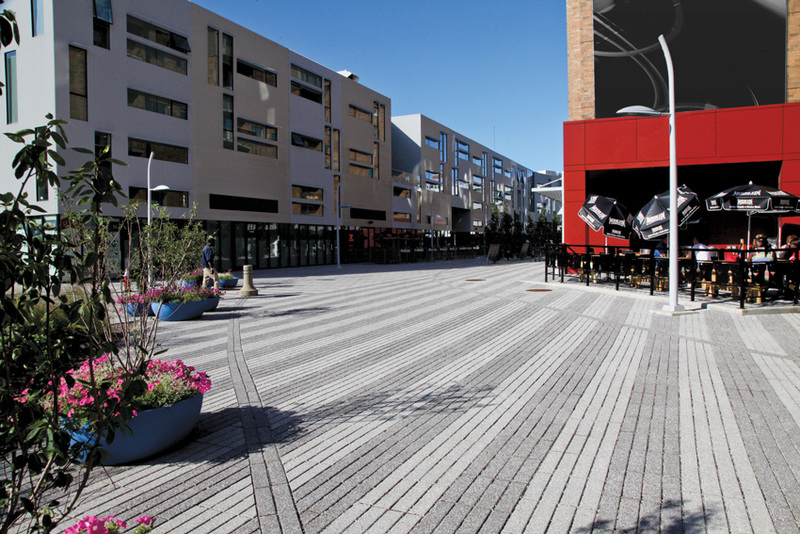 The construction industry has provided a wide range of paver products for permeable installations, with many stock options as well as custom color and finish design choices. There are also many more styles available, ranging from traditional to contemporary and everything in between. There are finishes that are stain resistant, some that look like granite, and others that are solid or mixed colors with a tighter finish on the surface that is more durable and color fast. This allows the designer to match a visual aesthetic with the sustainability traits of a permeable surface. Ultimately, this all means that design professionals don’t have to compromise on their design vision just because they are choosing a permeable pavement. A permeable paving system can be used in many combinations as part of a green initiative. For example, it can stand on its own as a permeable surface, it can work in conjunction with other features such as bioswales or detention basins, or it can be designed as part of a rainwater/stormwater harvesting system. Any of these systems can be created in pedestrian, vehicular, or even heavy-duty vehicular applications. Many permeable products can also be mechanically installed, which offers an incredible labor savings since 10,000 to 12,000 square feet per day can commonly be installed with just two people. Of course, as permeable installations continue to increase in popularity, they must also be maintained properly to be effective and to look good in the long term. Proper maintenance will ensure the full, long-term life cycle of the permeable system, which allows its true value to be realized. 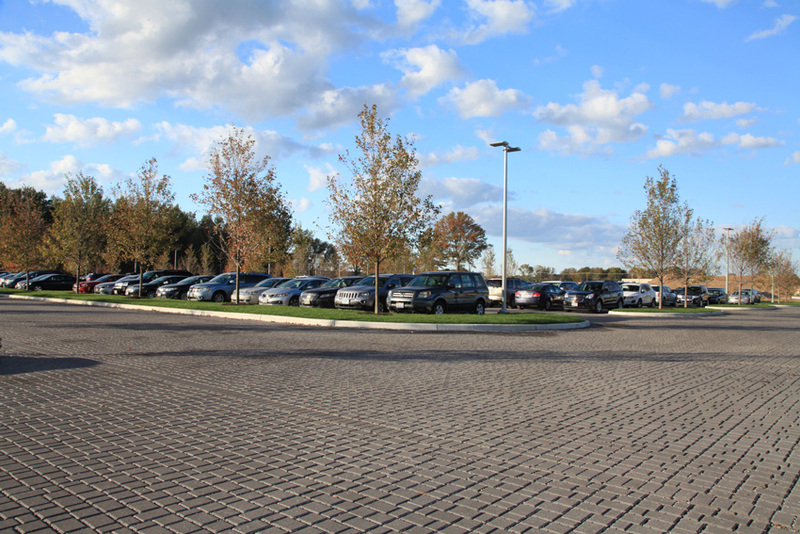 Permeable pavers can be used successfully for walkways, parking areas, and vehicular access, while still allowing rainwater to enter into the ground naturally and controlling runoff effectively. Addressing the need for thermally improved products, the PX32 XTherm® window series offers thermal breaks for high-level thermal resistance. And with modern, upgraded hardware for easy operation and maintenance, and a complete line of thermal subframes, mullions, and architectural sills, PX32 is a flexible solution well-suited for many project designs. Mitsubishi Electric’s CITY MULTI L-Generation features unique HexiCoil™ zinc-aluminum heat-exchanger technology that delivers an up to 50 percent reduction in required refrigerant charge. You’ll also gain much more flexibility in design and placement thanks to a 30 percent smaller system footprint. It’s time to save money and space, while increasing efficiency. This interior roller shade fabric for commercial buildings is used for solar heat and glare reduction where environmental and sustainable features are priorities. Its unique design, composition, and Cradle to Cradle Bronze certification provide a solution for roller shade projects in which the most stringent environmental and sustainable standards must be met. SageGlass® is advanced dynamic glass that can be electronically tinted or cleared to optimize daylight and improve the human experience in buildings. SageGlass enables you to control sunlight and glare without blinds or shades, maintaining your view and connection to the outdoors and significantly reducing energy consumption. Technoform specializes in the development and manufacture of components that improve the thermal efficiency of the window system. Technoform Bautec produces high-precision polyamide insulation profiles for aluminum windows, doors, and facades. Technoform Glass Insulation produces a warm-edge spacer to reduce heat transfer and maximize protection against gas leakage and moisture penetration. Town Hall street paver from Unilock has been designed to satisfy both permeable and traditional installation methods, while maintaining a time-worn historical and distressed appearance. It’s now available in six standard colors, ensuring that your design vision will come to life. Contact us for samples today.